˚ (read “Degree”), at the Luminary Center for the Arts through May 11, brings together ten works by Stephen Cartwright and Andrew James. The works share both conceptual and superficial resemblances. They are precise in line and movement and striking in color and texture. The precision speaks to the work’s reliance on data. Cartwright works from a variety of data sets, including his location (latitude, longitude, and elevation, hourly, since 1999) and his running and cycling mileage over the course of several years; while James creates four distinct works (or six—the three “totums” are listed separately in the program) from the same data set, the daily high and low temperatures in St. Louis (specifically, zip code 63104) in the years 2009, 2010, and 2011. Cartwright’s “Mesh 2” is a graph—its leading edge plots the artist’s average running and cycling mileage over the course of a year—but it evokes a topography. (The same can be said of his “Range” and “Difference.”) An irregular surface, a mesh of axes in three dimensions, “Mesh 2” appears to drift, suspended, as if—and in spite of plenty of visible hardware (screws, hooks, wires)—it were weightless. 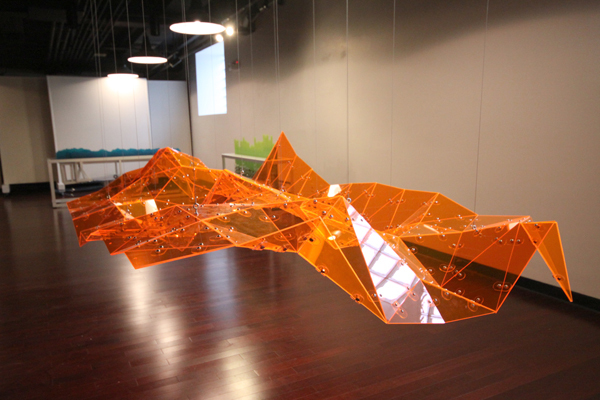 In all four of Cartwright’s works, its fabrication—its madeness—is apparent: in addition to the hardware, the material of “Mesh 2,” a translucent, day-glo orange acrylic, is patently artificial. (And, I should say, magnetic—I felt drawn to it by some childlike appetite.) In “Range” and “Divergence,” the mechanism (reiterating the work’s precision) is also apparent—the guts, so to speak, both visible and audible. 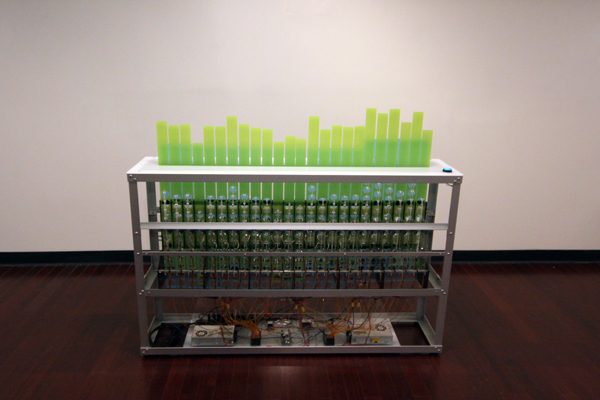 In “Range,” a series of eight, blue-green acrylic cut-outs, representing (according to Cartwright’s website) “the 30-day rolling average of all miles run” in the years 2002 to 2009, moves—flows, really—atop an aluminum frame, under the power of a set of motorized cranks, threaded with a cat’s cradle of vinyl cord (you can see it in action here). In both “Range” and “Divergence,” the mechanism—the motor’s mesmerizing hum and satisfying click, the circuit’s striking visual repetition—contributes to the pleasure of the work. Stephen Cartwright. 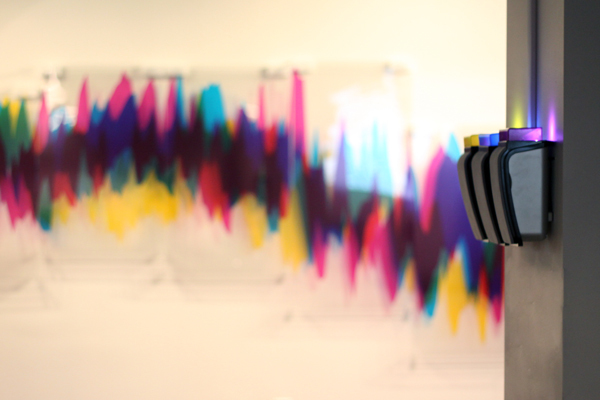 Installation view at The Luminary Center for the Arts. James’s “Weather Report, 2009, 2010, 2011, 63104 Daily Bar Graph,” a video animation, is an enchanting, silent screen of flickering color, each color (in the Thai tradition) signifying a day of the week, and each flicker a high and low temperature, charted in time, three years playing across the screen at once, at a rate of roughly three days per second. Nearby, “Weather Report, 2009, 2010, 2011, 63104 (Aural Translation),” an audio installation, plays from six small speakers mounted on two facing columns (stand between them for the full effect), cycling through the same data set, with high notes for high temperatures and low notes for low, etc. The two works are uncoordinated (“Aural Translation” plays at a rate of two seconds per day) but they mesh in strange and delightful ways—as did the audio, at the opening, with the babble of human voices in the gallery. In conversation, James mentioned the attraction of data’s objectivity, its factualness—a factualness (it seems to me) effectively indistinguishable from abstraction. Data is abstract, “existing in thought or as an idea but not having a physical or concrete existence” (Apple Dictionary version 2.0.3): it stands between two existing things, between mileage and line, temperature and color, but it does not exist as these exist. James’s work, like Cartwright’s, is thus a series of translations (see both Cartwright’s website and James’s note accompanying ˚ ), among which “Weather Report, 2009, 2010, 2011, 63104 Yearly Comparison” is at once the most arresting and the most recognizable: an arc of three jagged, overlaid lines of brilliant, saturated cyan, yellow, and magenta, it could as easily chart the fluctuations of the economy as the atmosphere. Andrew James. Weather Report, St. Louis 2009, 2010, 2011, 63104. By contrast, of the four works, the three titled “Weather Report Totum” (one each for 2009, 2010, and 2011) are the least like the others, and they present an intriguing possibility: What if we pictured temperature, not as a jagged line, but as a series of glittering spirals? Why not? For me, James’s three twelve-sided columns recalled some ancient method of accounting, abacus or quipus. I have a history with weather, so such questions surfaced repeatedly as I looked at James’s work. I was reminded, in particular, that a description of the weather—whether a jagged line or a glittering spiral—is necessarily different, or distant, from what it describes. It involves translation, or transformation. We can describe the weather, it seems, only indirectly. Then again, weather is (arguably) the aspect of environment that we confront most directly. But it is also, in a number of ways, irreducibly mysterious. The meteorologist Edward Lorenz, who first identified sensitive dependence (and, by extension, chaos), observed that we cannot know what the weather will be tomorrow because we do not know what it is right now. The cold war anxiety and sense of impending doom that I grew up with has shifted from fears of global thermonuclear war to a doomsday scenario resulting from global warming and deadly storms. Allowing the collected data to dictate how the work takes shape removes my own fears and anxieties from the end result. And in “Aural Translation,” not only the concept but the software, in a way, takes the reins. To design the work, James recalls in an email, he used Garage Band “like a drawing tool,” assigning “the lowest note that is audible” to the lowest temperature, and so on. One effect of concept, of the artists letting go of the work, so to speak, is that several of the pieces—especially Cartwright’s motorized “Divergence” and “Range” and James’s works in time, “Aural Translation” and “Daily Bar Graph”—seem somehow independent. “Divergence” and “Range” click on and off ‘on their own’—that is, on schedule, but we don’t know what the schedule is—while the strips of color flickering across “Daily Bar Graph” appear to be engaged in some inscrutable calculation. To put it another way, the work is a kind of algorithm or equation that begins with the artist but continues on its own. The pleasure of Cartwright’s and James’s work lies not only in its precision but in its asymmetry. The same might be said of a bank of cloud, a forest canopy, a mountain range (which at least three of Cartwright’s works superficially resemble). It strikes me that this work evokes natural things, and not simply because it takes its measurements from elements of the natural world. It may, in fact, be as an algorithm that the work is closest to nature. This might seem like a contradiction—conceptual art is, at least in part, a reaction against ‘natural’ (spontaneous, creative, ‘organic’) art. The conceptual artist doesn’t make work from the ground up, she assembles it from what’s around, from existing materials and ideas—or data. But the thing is, nature is this way, too. It is not creative—rather, as Goldsmith would say, it is “uncreative.” A flower is an algorithm, and a field of flowers is, like James’s work, the same data set rendered over and over again. Some will object that this diminishes nature, as concept diminishes art, but the evidence—the algorithmic beauty of the world and of the work assembled in ˚ —suggests just the opposite. 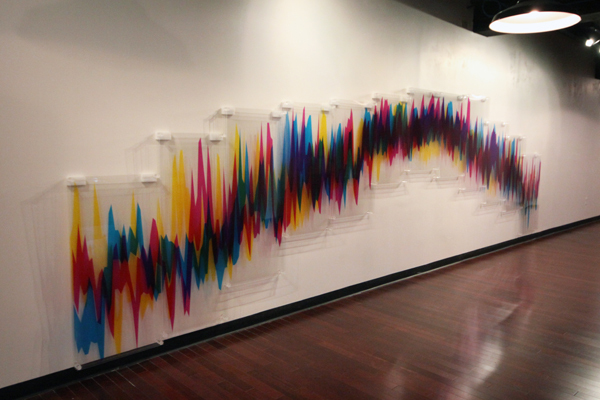 ˚ continues at the Luminary Center for the Arts, 4900 Reber Place in St. Louis, through May 11, 2012. The Luminary is open Wednesday to Saturday, noon to 6 p.m.